Morning – In the morning, the CBD route travels north on Loyola Avenue to Tulane Avenue, turns right on Tulane, right on Rampart then left on Poydras to Convention Center Blvd. Afternoon – In the afternoon, the CBD route travels north on O’Keefe to Poydras, turns left on Poydras, right on Loyola, right on Tulane, right on Rampart then left on Poydras to Convention Center Blvd. 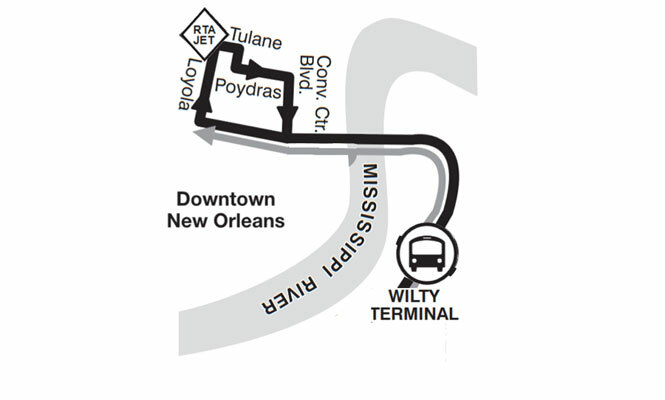 Route: Four routes travel from the Wilty Terminal to the New Orleans CBD: the Lapalco, Westbank Expressway, Terrytown, and Westbank Sunday Loop routes. 7:43 AM 7:58 AM 8:16 AM W2 Westbank Expwy. 8:47 AM 9:02 AM 9:20 AM W2 Westbank Expwy. 9:51 AM 10:06 AM 10:24 AM W2 Westbank Expwy. 10:55 AM 11:10 AM 11:28 AM W2 Westbank Expwy. 11:59 AM 12:14 PM 12:32 PM W2 Westbank Expwy. 1:03 PM 1:18 PM 1:36 PM W2 Westbank Expwy. 2:07 PM 2:22 PM 2:40 PM W2 Westbank Expwy. 3:11 PM 3:26 PM 3:44 PM W2 Westbank Expwy. 4:15 PM 4:30 PM 4:48 PM W2 Westbank Expwy. 5:19 PM 5:34 PM 5:52 PM W2 Westbank Expwy. 6:25 PM 6:40 PM 6:58 PM W2 Westbank Expwy. 7:55 PM 8:10 PM -- W2 Westbank Expwy. -- 8:23 PM 8:41 PM W2 Westbank Expwy.